There are 10 papers from members of the INNOVATE project, plus the Editorial. In case you do not have access through a license (the Editorial, at least, is open access), you can always ask the authors for a copy for your personal use. Join four round tables, the presentation of the INNOVATE Guidance Manual, and a panel to develop open questions and future research needs. Check out the Portuguese website version for more details of the program. In the last phase of the project, INNOVATE researchers worked together in order to develop a guidance, which presents and illustrates our research results comprehensively. The guidance, which is available in English and Portuguese, is a contribution to sustainable research by providing starting points for an implementation of research results into practice. Compacted into key messages and explanations along the sections water quantity, water quality, flora, fauna, agriculture, and society, readers can identify topics of their interest easily. Contact details from the researchers make possible an exchange about questions and suggestions about applications to other regions. 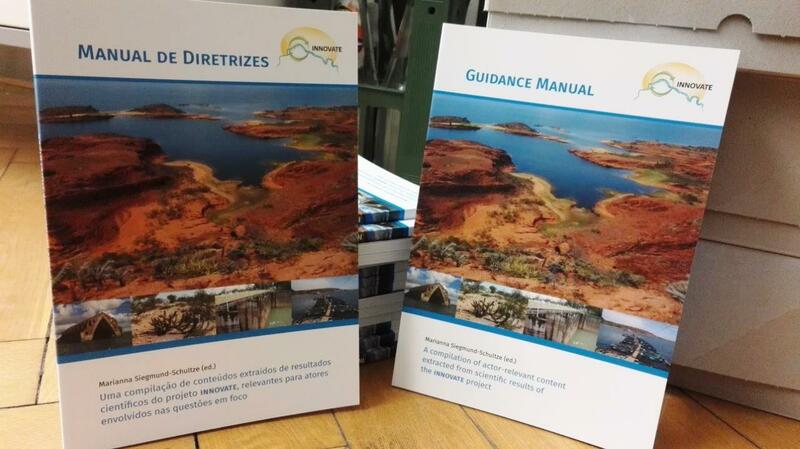 The Portuguese booklets are already on their way to Brazil and will be distributed to stakeholders. Thanks to all contributors! Watch the two INNOVATE-specific videos on constellation analysis and biological pest control! WOCAT is the acronym for World Overview of Conservation Approaches and Technologies (https://www.wocat.net/). We jointly developed a synthesis book for stakeholders based on scientific results of the twelve regional projects within the Sustainable Land Management program (Module A) of the German BMBF (compare). Click here to download the flyer introducing and presenting aims and contents of the book. You can download the complete book here (in English language only) – „Making sense of research for sustainable land management“ (on the page: http://www.ufz.de/index.php?en=42205). INNOVATE content is spread all over the book, check out the topics of your interest. 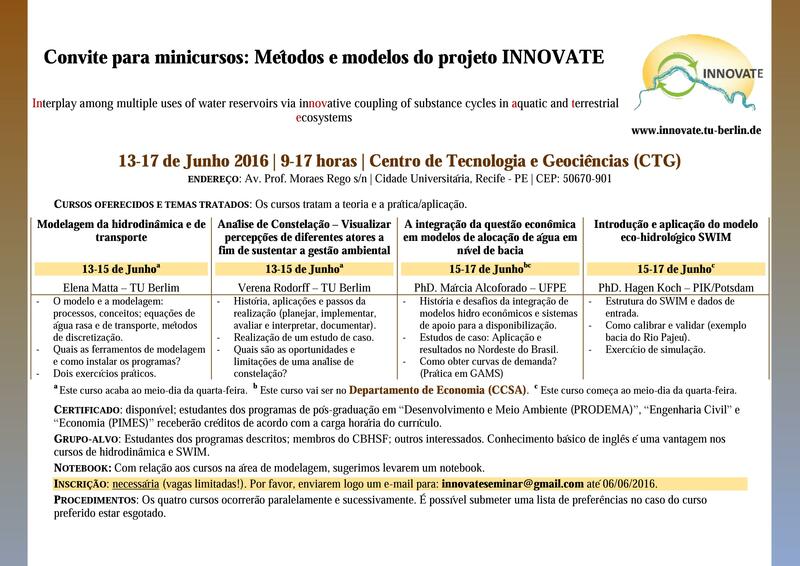 In June, our project once more demonstrated its dedication to knowledge exchange: Several INNOVATE researchers from both countries participated in the 1st Symposium on the São Francisco River Basin, taking place from 5th to 9th of June. They presented their work and results along with selected recommendations through more than 10 talks and posters, contributing to the integration of scientific results into decision making processes. The German members also used the time in Brazil to continue field work and participate in stakeholder meetings with CODEVASF. Another activity were the mini courses at the Federal University of Pernambuco, presenting in theory and applying in practice methods and models used in the project such as the Constellation Analysis. The interest of a high number of students as well as stakeholder institutions led to numerous participation and fruitful discussions. The courses therefore were a success and showed the significance of the INNOVATE project. For more photos of the Symposium and most recent research activities visit our Facebook page. The Final Conference of the Sustainable Land Management Program (BMBF, German funds) took place in March 2016 in Berlin. The AGB Peixe Vivo, the executive agency of the river basin committee (CBHSF), had been present - they are important stakeholders of the project and actors on basin scale. Several Brazilian researchers also managed to participate. It was a great event. Five lectures and five posters of INNOVATE were presented on day two of the event. Check the project's Facebook site for some pictures (click at the left on links). INNOVATE completed its second anniversary at the beginning of this year and invites to a two-day status conference in Recife. 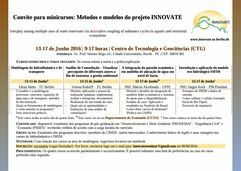 There will be presentations, poster sessions and panel discussions about the first results of the collaborative joint research project of Brazilian and German scientists. Aspects of sustainable land and water management will be discussed scientifically and their implications for stakeholders will be shown. The conference serves as a platform for internal project exchange and external communication with the interested public, including stakeholders. We will welcome consultants of the project funding institutions—BMBF (German Ministry for Education and Research), MCTI (Brazilian Ministry for Science, Technology and Innovation) and CNPq (Brazilian National Council of Technological and Scientific Development). For further questions and information check for updates on our website, on our Facebook profile or contact us. built in the 1980ies, dams up the São Francisco River in the semi-arid hinterland of Northeastern Brazil. The lake’s water quality is unsatisfactory with frequent algae blooms. About 40,000 people were dislocated. They could choose between compensation payments for moving out or resettlement in newly established smallholder irrigation schemes. Some of the irrigation lands suffer from poor soils and insufficient drainage systems. The INNOVATE project aims at a sustainable watershed management, exemplarily focussing on the Itaparica reservoir. Measures to reduce the nutrient content of the reservoir will be tested and assessed economically. The Green Liver System will be further developed to purify contaminated lake water. The impact of lake sediment and biochar application on soil fertility and crop yields in mixed smallholder systems will be evaluated. Changes of biodiversity and C sequestration accruing from management alterations will be monitored. Land use and hydrology will be modelled, accounting for climate change. Governance options for a sustainable aquatic and terrestrial management will be developed, based on constellation analysis. German partners are the Technische Universität Berlin (TUB), the Universität Hohenheim (UHOH), the Leibniz Institute of Freshwater Ecology and Inland Fisheries (IGB), the Potsdam Institute for Climate Impact Research (PIK) and the Senckenberg Natural History Collections Dresden (SNSD). The Brazilian partners comprise two federal universities at Recife (UFPE and UFRPE), the Agricultural Institute of Pernambuco state (IPA), the Institute for Technology of Pernambuco (ITEP), the Federal Institute for Education, Science and Technology of Pernambuco (IFPE), the soil section of the Brazilian Agricultural Research Corporation at Recife (EMBRAPA Solos), and the National Institute of the Semi-Arid Region (INSA).